A unique and constant feature of Bloom syndrome (BS) cells is an excessive rate of sister-chromatid exchange (SCE). However, in approximately 20% of persons with typical BS, mosaicism is observed in which a proportion of lymphocytes (usually a small one) exhibits a low-SCE rate. Persons with such mosaicism predominantly are genetic compounds for mutation at BLM, and the low-SCE lymphocytes are the progeny of a precursor cell in which intragenic recombination between the two sites of BLM mutation had generated a normal allele. Very exceptionally, however, persons with BS who exhibit mosaicism are homozygous for the causative mutation. 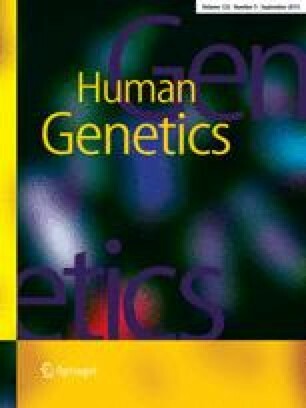 In two such exceptional homozygous persons studied here, back mutation has been demonstrated: one person constitutionally was homozygous for the mutation 1544insA and the other for the mutation 2702G→A. Revertant (low-SCE) lymphoblastoid cells in each person were heterozygous for their mutations, i.e., a normal allele was now present. The normal alleles must have arisen by back mutation in a precursor cell, in one person by the deletion of an A base and, in the other, the nucleotide substitution of a G base for an A base. Thus, back mutation now becomes, together with intragenic recombination, an important genetic mechanism to consider when explaining examples of a reversion of somatic cells to "normal" in persons with a genetically determined abnormal phenotype. An erratum to this article is available at http://dx.doi.org/10.1007/s004390100532.